Celebrate the season with the choirs of Christ Cathedral: The Diocesan Choir of the Diocese of Orange, The Diocesan Children's Choir, and the Christ Cathedral Choirs - English, Vietnamese and Spanish! You will help usher in this blessed season of Christmas with splendid carols, both new and old. This year’s major choral work will be the “Gloria” by Antonio Vivaldi. The Concert will also feature Guest Tenor, Cesar Sanchez. They will be accompanied by the Arboretum's 82-rank Aeolian-Skinner Organ and the Cathedral Orchestra. It will be a spectacular event which has already become an annual tradition of your holiday celebrations. Get your tickets early! Last year was completely sold out! 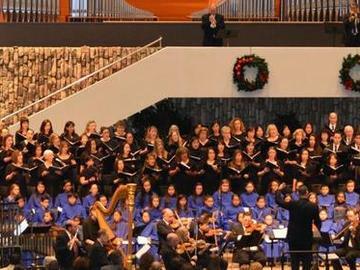 !Celebrate the season with the many choirs of Christ Cathedral: The Diocesan Choir of the Diocese of Orange, The Diocesan Children's Choir, and the Christ Cathedral Choirs - English, Spanish, and Vietnamese! Usher in this blessed season of Christmas with splendid carols, both new and old. This year’s selections include John Rutter’s Candlelight Carol, dedicated to our beloved music director Dr. John A. Romeri, and Antonio Vivaldi’s Gloria, one of the major choral masterworks of the baroque. The concert will also feature appearances by Guest Tenor, Cesar Sanchez. The hundreds of singers in this choral Christmas spectacular will be accompanied by the Arboretum's legendary 82-rank Aeolian-Skinner Organ and the Cathedral Orchestra. Christmas at the Cathedral has already become an annual tradition of Orange County’s holiday celebrations - get your tickets early as last year’s performance was completely sold out! !